Double the dolphin delight as you bring alive all sorts of merry, leaping ocean friends! Make a splash with this fabulous summertime pack, which lets you get creative drawing and painting lots of beautiful dolphins! The sight of a leaping dolphin is one of those special moments when you simply can’t tear your eyes away. The drawing book in here shows you how to recreate that excitement over and over, using heaps of fabulous art tips to make your drawings leap into life. 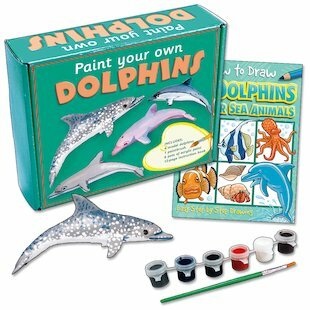 Meanwhile, get busy with your paints to decorate four prancing dolphin models – perfect for adorning windowsills, making 3D underwater scenes, or hanging up in a spinning dolphin mobile!